"So infectious that the most ardent climate sceptic would have trouble staying still"- Sydney Morning Herald. 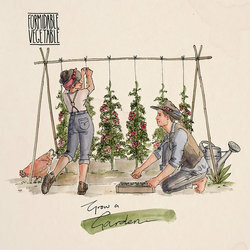 Having planted their tendrils into every corner of the globe from Glastonbury Festival to the United Nations (who acclaimed them for "singing about the important issues of the world"), Formidable Vegetable is using their quirky brand of musical activism to de-pave the problems and grow fertile, abundant solutions in their place. Over the years, they have become a favourite on the Australian and international festival circuits, having played at some of the biggest events in the world alongside Radiohead, Tame Impala and The Rolling Stones. Realising that music is one of the best tools for learning and inspiring new behaviour, frontman Charlie Mgee has dedicated his musical mission in life to composing fun tunes on a ukulele about creating the kind of world we want to live in. Fresh off the cob with savoury retro-flavoured good vibes all round, Grow a Garden isn’t just a pop song with smooth beets, radish production and an unshakable hook - it’s everything plus. Grow a Garden will warm the hearts of aspiring backyard-farmers, get you boogieing in your overalls and leave you with the satisfaction that comes with eating fresh-picked strawberries.